Tugboats pull the USS Independence aircraft carrier toward the carrier’s final destination to be scrapped yesterday, early afternoon. BROWNSVILLE — A crowd showed up at Isla Blanca Park yesterday to bid farewell to the decommissioned USS Independence. Among them were a number of Navy veterans who served aboard the aircraft carrier. One of them was Jack Gonzalez, a native of Puerto Rico who grew up in New York and now lives in Corpus Christi. He served aboard the Independence from 1964 to 1967, including a tour off the coast of Vietnam in 1965, as a boatswain’s mate. Gonzalez fondly remembers his promotion — per naval tradition — from “Pollywog” to “Shellback” upon crossing the equator, and then to “Blue Nose” after crossing the Arctic Circle. “Those are two memorable moments,” he said. The Independence’s 16,000-mile journey to the Port of Brownsville from Bremerton, Washington, ended yesterday afternoon. It is due to be dismantled. Seeing the Independence headed to the shipbreaking yard was heartbreaking, Gonzalez admitted. “I worked on a tugboat after I retired, and I brought in the Lexington into Corpus Christi,” he said. “I helped bring that ship in there as a museum. This one could have very easily become another museum somewhere — South Padre Island. Gonzalez, who spent eight years in the Navy and then worked as a merchant marine until retirement, said he made a lot of friends on the “Indy,” some of whom he still keeps in touch with 50 years later. James Ory, originally from Corpus Christi and now a resident of San Antonio, served on the Independence from 1970 to 1971. It was a positive experience, though his job on the ship’s No. 3 waist catapult was hard work, he recalled. It was quite a white-knuckle experience for a 20-year-old, he said. And dangerous of course: A lot of guys didn’t make it, he remembers. Ory said he still keeps in touch with friends he made onboard back then, and plans to send photos from Thursday’s arrival to former shipmates in Boston and Michigan. “You’ve always got a connection to a ship — especially your first ship,” he said. “It’s the last time I’m ever going to see it. Robert Maxwell served on the Independence from 1976 to 1979 as a boatswain’s mate. A New York native, he moved to San Benito straight from Norfolk, Va., the carrier’s home port, right after leaving the Navy and still lives in the same house. Maxwell said he was proud to have served aboard the ship but didn’t necessarily enjoy being at sea, feels no emotional attachment toward the Independence and doesn’t mind that it’s being scrapped — though he still came out to see it Thursday. All the same, it was an education, he said. He spent a considerable amount of time with the Independence in dry dock at Portsmouth Naval Shipyard and received commendations for his work overhauling the ship. Pat McDermott, a Harlingen resident and self-described Navy brat, was hanging out with Maxwell, who he’d just met. McDermott served on the Independence from 1988 to 1991 as a boiler technician in the engine room and said he had a great time in the Navy. McDermott put two Western Pacific cruises under his belt, sailed to the Middle East, all over Asia, and Central South America, he said. 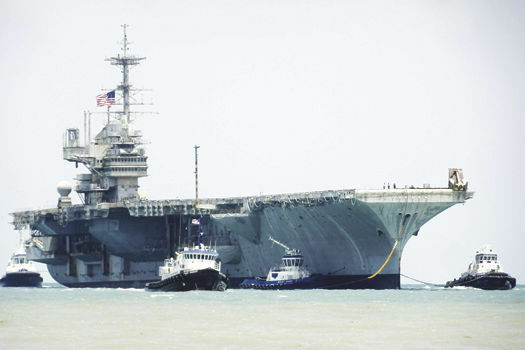 When Saddam Hussein invaded Kuwait in 1990, the Independence was the first U.S. carrier to enter the Persian Gulf in 28 years, McDermott said. The experience also taught him responsibility, McDermott said. “When you’re a kid that age, it’s the first time somebody says, here’s this couple-million-dollar piece of equipment. I need you to tear that down and rebuild it. OK, give me a tech manual. I’ve got this.